After having a lot of fun writing up last year’s best-of Bandcamp list, it seemed a no-brainer to work through another one this year. Any opportunity to let some of these fantastic albums get a second glance is worth looking into, and thus the list was expanded from 11 to 15 this year to sneak a few more worthy titles in. With my own list tapping into some of these Bandcamp releases as well, the one stipulation was that the release didn’t end up in my personal top ten (Wilderun, Amiensus, Rest Among Ruins). That being said, these releases are the cream of the crop – you won’t find a better bang for your buck. If there’s one 2015 album that is focused on writing the best possible songs around, it’s This Ruined World. Nine tracks with their own identity despite the focus on death/thrash of the highest order. From grooves to breakneck anger and violence to burn-into-your-skull melodies, Trials has delivered it all with this release. Equal parts addictive and aggressive, and fantastic from start to finish. I Legion’s long-anticipated sophomore effort ups the number of superstar players (a veritable who’s who of melodic metal) involved and actually plays to the members’ strengths. There’s a wide net of diversity cast with the tracks (and number of people) involved, but somehow it works and even enhances the formula that allowed Beyond Darkness to be so catchy and memorable. The only album on this list that didn’t receive a review (coming soon!) due to its recent release, the return of the perpetually under-rated Martriden holds high everything that the band has accomplished to date and continues them forward in their evolution. The blackened death backbone is ever-present, but with even more experimentation and progressive tones to cast the band into a league of their own. Malcolm Pugh’s uber-technical death metal project returns after a 5 year lull with just as much precision and melodicism as Psalms of Misanthropy. Few can match the rapid-fire riff execution and wow factor present here, but the biggest surprise is how retainable the songs are in the long run. This is heavy, technical, and brutal as all get-up, but you’d be hard-pressed to get any of these songs out of your head quickly. How do you accurately sum up the sound of Immortal Bird in a few words? There’s no easy way – which is what’s so genuinely exciting about the band. It’s heavy, angry, eerie, and thoroughly engrossing. There’s a number of great, sinister melodies to be found as well. 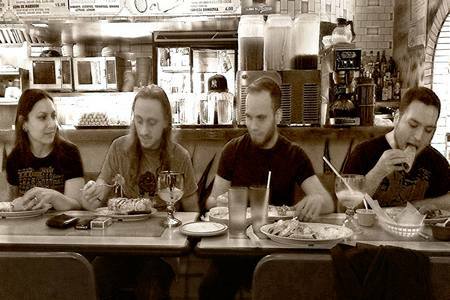 In a sea of sound-alike bands, Immortal Bird aspires to create music that casts a unique shadow. Fans of Katatonia, Paradise Lost, and Antimatter should be clamoring at the bit for Deathwhite. Mixing just enough post-metal and serious doom and gloom, it’s an addictive mix for rainy day metalheads. A massive step-up vocally from the debut EP, there are hooks galore to add to the already strong depressive crunch that will keep many coming back for more. Modern melodic death metal doesn’t get much sweeter than this. Plenty of technically-inclined riffage with a heavy synth presence combines to create a constant barrage of addictive hooks and melodies. Add to it a strong concept/story to wrap the album around and you’ve got a real winner here. This is all but certain to catch a strong buzz soon. An impressive undertaking of the traditional European doom/death aesthetic and bringing it to American shores, as well as coupling it with a number of other branches to give it a unique feeling. There’s gothic undertones, progressive and symphonic/electronic elements, but most importantly, there’s a ton of emotion resonating from the gloomy core that is sure to win over fans of the sound. With only three songs to work with, Inhumatus still draws from quite a diverse pool of influences. One moment they are in the midst of brutal, death metal riffs and guttural vocals – then they switch things up with a quiet acoustic moment or progressive flourish. The lengthy tracks benefit from the band’s exploratory nature, and there’s loads of potential for the next outing. Oh, and this is a FREE download! Those looking towards the roots of the melodic death metal genre and wondering “why doesn’t anyone do it like that anymore” hasn’t heard Silence Lies Fear. Sweeping and grandiose guitar harmonies and leadwork that would do Dark Tranquillity proud alongside razorsharp riffs give this a level of nostalgia while upping things to a 2015 standard. Technical death metal that vigorously infuses itself with progressive inclinations in equal measure. Forward thinking material that frequently captures the imagination with its playful and surprisingly melodic leanings and atmosphere while assaulting the rest of the senses in brutal and barbaric blasts of technical madness. Symphonic death metal that does an incredible job of weaving in the synth-heavy workload into a fully operational death metal machine. Entering Oblivion never forgets that it is a death metal album first and foremost, keeping the riffs brutal (yet retaining an ear for melody) and using the synth only to spice up and add variety to the proceedings, instead of dominating them. Switching gears from full-on technical death metal wizardry to more symphonic grounds isn’t easy, but leave it to Ouroboros to pull it off, and somehow come off a stronger band for it. There’s much depth to be found in Emanations, with the integration of an actual symphony and brutal death metal riffs, and the atmosphere is exquisite. Equal parts beauty and the beast, while shorting neither. Taking a classic metal vibe and weaving in more modern guitar fireworks and heavier tone, there’s a broad range of appeal that Olathia caters to with their approach. Some real ripping solos and plenty of catchy riffs and vocal hooks from start to finish are what garner the most appeal. Fans of everything from Iron Maiden to Iced Earth to Arch Enemy should dig this one quite a bit. The excellently descriptive title on this one should give you all the information you need. Modern thrash akin to Revocation and Black Fast with the fun factor completely intact. Never taking themselves too seriously (despite the all-too-serious case of whiplash your neck will have), each track oozes with personality and makes Hyperthrash a real winner.